If you gave “Looney Toons” director Tex Avery and camp theater master Charles Busch a couple of martinis and access to your nearest children’s storybook, you might wind up with something like Theatre of Youth’s thoroughly zany production of “Robin Hood,” which opened Friday on the Allendale Theatre stage. Under the direction of comic mastermind Chris Kelly in his very welcome TOY debut, Greg Banks’ adaptation of the classic tale of derring-do and adventure takes on the look and feel of a particularly inspired Saturday morning cartoon. Against a wooden set strewn with ropes for swinging and all kinds of nooks and crannies for hiding, this one-act version of everyone’s favorite proto-Marxist fairy tale earned an ecstatic reception from kids and adults alike during its opening night performance. The story-within-a-story setup, in which a group of enthusiastic storytellers re-enact the tale of Robin Hood and his merry band of thieves, is effective at pre-empting young theatergoers’ concerns about boredom in the same manner as films such as “Hook” or “The Princess Bride.” And once that story is off and running, its hooks are in for good. Actors frequently run or prowl through the aisles on their various adventures, making their way to wooden set pieces on either side of the theater. There’s plenty of cheeky audience interaction, including a bit in which Robin Hood and his jaunty companions run one way and the crowd instructs the comically evil Sheriff of Nottingham to run in the other and sends him bumbling through the aisles. Sophisticated this ain’t, but it is perfectly executed. None of the several dozens of vaudevillian bits in the show would work without a talented cast to carry them off, and this production has talent to spare. As our fearless hero, Adam Rath embodies the perfectly exaggerated self-confidence of a Disney prince while adding his formidable physical theater skills to the mix. Rath, who becomes noticeably better with each performance, is perfectly cast. As the Sheriff of Nottingham, Adam Yellen is a consummate buffoon. He overacts in exactly the right spots and to exactly the right degree. Even in his Shakespearean death scene at the end of the show’s best sword fight, this guy could give Alan Rickman a run for his money. In a variety of roles, Anthony Alcocer frequently upstages his fellow cast members. 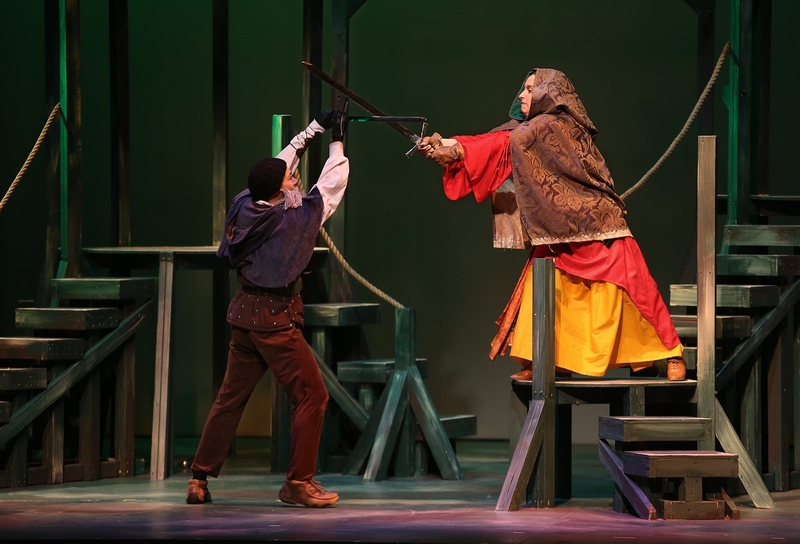 He plays the cruelly effete Prince John with great theatrical ineptitude and adopts an Antonio Banderas-flavored Spanish accent and any number of ridiculous flourishes as Robin Hood’s faithful follower Will Scarlet. Why Scarlet has a Spanish accent is never explained, but it is a great example of the weirdly addictive illogic that motivates the play. The multitalented Megan Callahan, Alan Trinca and Billy Horn round out the fine cast. Like many of Kelly’s best productions, this one seems to have arisen organically out of its performers’ desire to tell a story using the means at hand. That those means in this case include the extraordinary set and costume designs of Kenneth Shaw, the fight choreography of theater veteran Steve Vaughan, Billy Horn’s compositions and Chet Popiolkowski’s musical arrangements and sound design are more bright arrows in Kelly’s already well-stocked quiver. It’s heartening that Kelly has teamed up with TOY. If this production is any indication, it looks to be the beginning of a beautiful friendship. Where: Allendale Theatre, 203 Allen St.